We are back for another segment of International Deposition Tips with Optima Juris. 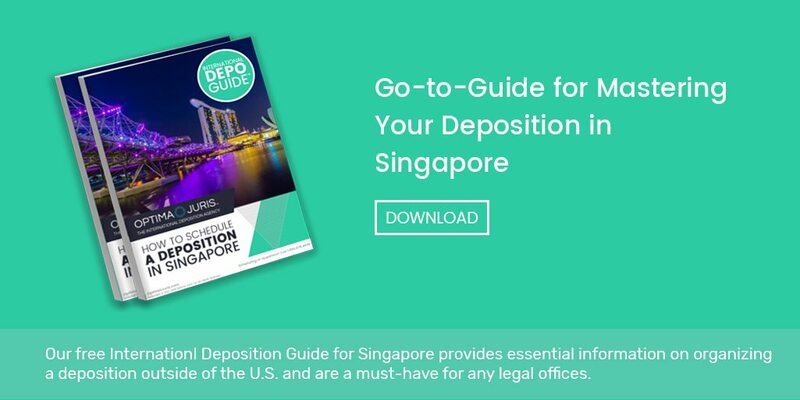 Today, Ian Hardy, President of Optima Juris, walks you through the legalities for setting up a U.S. deposition in Singapore. If you are a lawyer, paralegal, or legal professional looking to organize a deposition in Singapore, you will want to watch this video. Singapore is a great location to conduct a deposition in Asia. In general, you can depose willing witnesses in Singapore without any special formalities or involvement of foreign courts. Optima Juris has local court reporters, legal videographers and interpreters throughout Singapore. Always be sure to plan as far in advance as possible. The further you plan ahead, the more likely it is that you’ll be able to locate and book the right, Singapore-based professional for your deposition. This easy-to-use guide covers frequently asked questions, tips on how to swear in a witness abroad, best options for deposing a witness remotely, a user-friendly checklist, and travel tips. To access your copy, please visit http://www.optimajuris.com/International-Depo-Guide-Singapore.pdf. Optima Juris is the only U.S. agency exclusively dedicated to international depositions. We have been helping law offices across the globe find the highest quality certified court reporters, legal videographers, and interpreters for over 17 years. If you should have any questions about international depositions, please do not hesitate to contact us or fill out a free quote to see how we can make your international deposition a complete success.